At Wilmington’s heart is a vibrant Downtown. 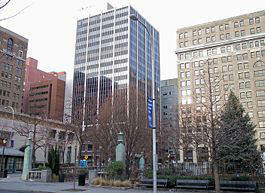 The Downtown is filled with symbols of the City’s rich history such as Old Swedes Church, Willington Square, and Rodney Square. In recent times, financial institutions have relocated to the Downtown area, driving the economic resurgence of the State. These institutions have helped attract new residents to the City. People have begun to rediscover the conveniences that result from living, working, and playing in the Downtown. The Downtown faces a number of transportation challenges. Poor intersection configurations, congestion from both automobiles and transit buses, and impediments to pedestrian and bicycle movement hinder mobility. Several studies, plans, and initiatives are all working to achieve a common goal: a more livable and mobility-friendly Downtown Wilmington. As a result of the Wilmington Initiatives, the Downtown Wilmington Transportation Study was completed in August of 1997. (In 1996, a Transportation Fact Book was produced to summarize all data collected as part of the larger study, to serve as a foundation for formulating recommendations.) The study evaluated circulation along all major routes within the Downtown. Three goals guided the early Transportation Study: 1) promote economic development, 2) improve the physical environment for workers and residents, and 3) enhance accessibility to and within the Downtown. Ultimately, the study recommended a series of multimodal improvements that were to be implemented within the Downtown to better serve transportation needs, while mitigating traffic congestion and facilitating transit-oriented growth within the City. Following its completion, several recommendations from the study have been implemented, however, additional recommendations remain to be implemented or re-evaluated. In the decade since completion of the original 1997 Transportation Study, significant developments have occurred and it is important for the effects of these developments to be studied from a transportation standpoint. WILMAPCO will manage this project in cooperation with DelDOT, the Delaware Transit Corporation (DTC) and the City of Wilmington, as well as work with the project’s consultant Whitman, Requardt and Associates, LLP (WR&A). In order to keep up with development occurring along the Riverfront, the study area has expanded from the 1997 report, to encompass Downtown Wilmington and the Central Business District (CBD). This study will include new development along the Christina River, which will serve as the southern boundary of the study area. The northern boundary is the Brandywine River, the eastern boundary is Walnut Street and the western boundary is Interstate 95. With the project’s kick-off in July 2008, the goals of the updated circulation study are to: 1) incorporate land use changes that have occurred since the completion of the original study, 2) evaluate whether the improvements which have been completed are addressing transportation needs in the area, and 3) evaluate the need and justification for additional improvements. The updated circulation model, developed by WR&A, will address the effects that growth within the Downtown area have had on the transportation system, will evaluate all modes of transportation with the goal of making each mode more efficient for users, and will make recommendations that will move forward with optimally attaining these important goals. Meetings with Downtown stakeholders will be conducted, and three public workshops will be held. The workshops will be used to gather information from the public regarding their needs and concerns with the transportation system and to present study results and recommendations. Additional meetings will be held with key Downtown stakeholders, with discussions regarding the public’s input to the process, the initial findings of the modeling efforts, and the proposed improvements, as they relate to achieving sustainable transportation improvements. At the completion of the study, which is slated for August 2009, a technical report will be prepared to clearly document the data and outcomes of the study. If you have any questions, please contact Dave Gula at 302-737-6205 x122 or dgula@wilmapco.org.